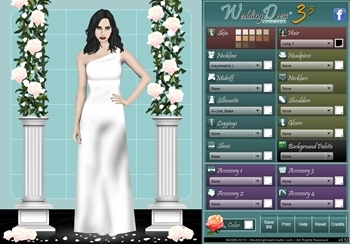 "Using These Easy Wedding Dress Design Online Tools!" "Design wedding dress online tools will help you bring your dream bridal dress to life." Whether you are designing just for fun or you are designing a wedding dress for your wedding... using wedding gown design tools make things easy. The best thing about using online design tools is that no drawing skills are necessary. And when you are finished you can print out your design.. Isn't that great! This is for the "do it yourself bride" who wants to "design a wedding dress online! Weddingdresscreator.com is a site you really feel like you are designing your wedding dress! What are the features? The virtual model used is more realistic looking and can change from a small size to a plus size model to reflect a size representative of the user. You can make the model's skin tone various shades. On this site you can try out different necklines and silhouettes as well. What I like is that you can save your work by printing it out or save your work as a "jpg". You can reset, create and save as many designs as you like. If you are like me you'll find it to be very addicting once you start playing around with all the tools. Moonlight Bridals has a design wedding dress online tool where you can restyle or redesign their dresses by making custom changes to the neckline and bodice. They also allow you to add sleeves and additional details to the skirts and trains of their wedding dress designs. Please be careful of the off shore wedding dress sites that offer to design and make your gown for incredibly low prices. There are some that are scams and others that just don't provide a quality product and good customer service. But there are some that can provide a good representation of what you want. You just have to check each company out carefully.